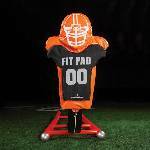 The FIT PAD® offers a double decker pad. Top pad mimics the look and and feel of a shoulder pad with jersey. Allows hand grip on side. "The coaching point is to get a hand grip!"